Background: L-proline organocatalyst was supported on graphene oxide/Fe3O4 nanocomposite by using non-covalent immobilization technique. Methods: The mixture of the dried GO/Fe3O4 (1 g) and L-proline (0.5 g) was sonicated in deionized water for 0.5 h and further stirred at room temperature for 24 h. The prepared GO/Fe3O4/L-proline nano hybrid was separated by an external permanent magnet and dried under vacuum. Results: Hydrogen bonding interactions between L-proline and graphene oxide support made the organocatalyst to be easily recoverable using an external magnet. The prepared heterogeneous catalyst was well characterized using FTIR, TGA, DTG, XRD, TEM, SEM and elemental analysis techniques. Gaussian statistics measuring was used to calculate the median size of Fe3O4 nanoparticles.This novel superparamagnetic graphene oxide/Fe3O4/L-proline efficiently catalyzed the synthesis of 3,3́- diaryloxindoles derivatives in the reaction of indole and isatin and good to excellent yields were obtained in ethanol under reflux condition. Conclusion: This method improves the thermal stability of L-proline organocatalyst. The results showed that immobilized L-proline on GO/Fe3O4 nanocomposite has better catalytic activity than pristine L-prolin at the same weight ratios. 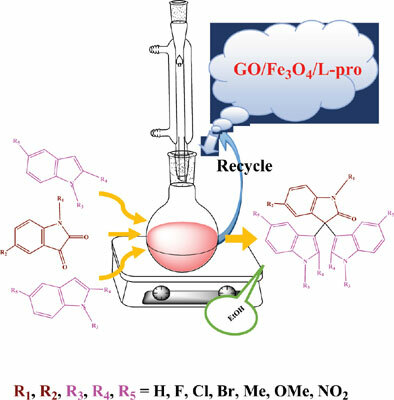 GO/Fe3O4/l-proline catalyst can be recovered simply by applying an external magnet and reused at least for eight runs for the one-pot pseudo three-component synthesis of 3,3́-diaryloxindoles derivatives. 3, 3́-diaryloxindole, graphene oxide, heterogeneous catalyst, L-proline, nanocomposite, organocatalyst.